Kitchener, ON. : The Sarnia Sting and Kitchener Rangers engaged in a back-and-forth affair on Friday. After 60-minutes of play, the game was tied 5-5, which sent the affair to overtime. The extra five-minutes solved nothing and that forced the game to be decided in a shootout. 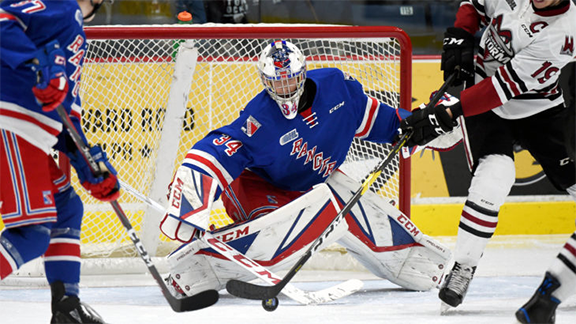 In the shootout, Rickard Hugg scored Kitchener’s third goal, which was followed up by a save from Lucas Pfeil to help the Rangers win the shootout 3-2, and 6-5 overall. Lucas Pfeil stopped 30 shots in the win and his most important save of the night came against the final. Riley Damiani, the game’s first star, picked up two goals and an assist on the night. The Sarnia Sting (7-9-2-0) were at The Aud on Friday night for the Remembrance Day game versus the Rangers (9-8-2-0). The starting goalies were Lucas Pfeil(2-1-1-0) for the Rangers and Aidan Hughes (3-4-1-0) for the Sting. Kitchener opened up the scoring at 3:25 of the first on Arber Xhekaj’s first goal of the season, unassisted, which put the Rangers up 1-0. Sarnia responded in kind 24-seconds later with a goal by Ryan McGregor, his seventh, and that made the game 1-1 early on. At 5:28 of the opening frame, the Sting took their first lead of the game on a goal by Justin McCombs, his second of the season, and it was 2-1. The Rangers didn’t take long to reestablish parity with the Sting. At 7:13, still in the first period, Riley Damiani netted his seventh of the season to make it 2-2. Isaac Langdon and Jonathan Yantsis picked up assists on the goal. Then, at 10:10, Sarnia took the lead for the second time that period on Curtis Egert’s first goal of the season, 3-2. The period would end with the Sting up in shots, 11-10. Sarnia’s Sean Josling took the game’s first penalty at 4:59 of the second period. While on the powerplay, Kitchener got caught in an odd-man rush that resulted in Sarnia’s Calvin Martin scoring his fifth and doubling the Sting’s lead, 4-2. Jonathan Yantsis, off a wrist shot from the Hughes’ right hashmark, fired home his team-leading 14th goal of the season with assists from Justin MacPherson and Greg Meireles to bring the Rangers within one, 4-3. One minute and fourteen seconds later, at 15:24, Damiani, on a wraparound while falling, netted his second goal of the game and third point of the night and suddenly the Rangers and Sting were tied, 4-4. Then, at 16:05 of the middle frame, Franco Spoviero of the Sting manage to restore Sarnia’s one-goal lead to put the Rangers down one, 5-4. Off a faceoff, and with just 9-seconds left in the second, Rickard Hugg fired home his 9th of the season and made it 5-5 going into the final frame. Kitchener led in shots after two, 28-22. Outside a Chase Campbell high sticking penalty and a puck to the face of McCombs that resulted in the Sting player missing a few shifts, the third period produced no goals and the game was forced into overtime with Kitchener leading in shots 36-34. Overtime also didn’t produce anything for either side and that brought the game to a shootout. The shootout was decided on the fifth shooter. Rickard Hugg buried one for the Rangers and that put the game on Sarnia’s Josling, who was stuffed by Pfeil to give the Rangers a win in the shootout 3-2, and overall, 6-5. Kitchener outshot the Sting 38-35. Kitchener returns to action on Sunday, November 11 at 2:00 pm when they play the Knights in London. The Rangers next home game is Friday, November 16 at 7:30 pm versus the Saginaw Spirit. Peterborough, ON. : The Rangers visited the Peterborough Petes in what ended up being a 5-3 win for the Blue Shirts. Jonathan Yantsis picked up a goal and an assist while Chase Campbell, the game’s third star, scored twice to raise his season goals total to four. Greg Meireles picked up his eighth goal of the season and Justin MacPherson scored his first on the year. Rickard Hugg also had a two-point night with a pair of assists. Luke Richardson earned first-star honours by stopping 40 of the 43 shots he faced to help bring Kitchener’s point total on the season to 18. The Kitchener Rangers (8-8-2-0) visited the Peterborough Petes (11-8-0-0) for the Rangers only visit to the Peterborough Memorial Centre this season. At 4:49 of the first period, the Rangers forced a tripping penalty against Cole Fraser, which led to Yantsis’ 13th goal of the season 44-seconds into the powerplay. Riley Damiani and Hugg picked up assists on the goal. Jack York took a checking from behind penalty at 17:04 of the opening frame and it led to a powerplay goal by Erik ?ermák to tie it up 1-1, and that’s how the period would end. The Petes outshot the Rangers 13-10 going into the intermission. ?ermák opened up the scoring at 2:53 of the middle frame with his second of the night and third of the season to put the home side up 2-1. Shortly after the Rangers killed a Michael Vukojevic holding penalty, the Blue Shirts strung together a series of perfect passes that culminated in Campbell netting his third goal of the season to tie it up 2-2 at 6:07. Yantsis picked up his second point of the night and Joseph Garreffa got on the scoresheet with assists on the goal. MacPherson, at 10:44, came roaring out the penalty box after getting called for a slash and scored his first goal of the season to put the Rangers back up on top, 3-2. Arber Xhekaj took a roughing penalty at 14:33, the Rangers third of the period. After a 3-on-2 shorthanded rush by Kitchener was stopped by Peterborough’s Hunter Jones, the Petes broke out the other way on a 4-0n-2 that ended with Christopher Paquette scoring his 11th of the season and that made it 3-3. Almost immediately after another penalty to the Petes’ ended at 16:48, Chase Campbell scored his second goal of the night to put the Rangers on top 4-3 and that’s how the period would end. Peterborough led in shots going into the third, 36-15. Besides a couple Petes penalties, the third period saw no scoring until 19:32 when Greg Meireles sealed the deal for the Rangers with an empty net goal. The game ended 5-3. The Petes led in shots 43-25. Kitchener returns to action on Friday, November 9 at 7:30 pm when the Sarnia Sting visit The Aud. The Rangers next road game is Sunday, November 11 at 2:00 pm versus the London Knights.